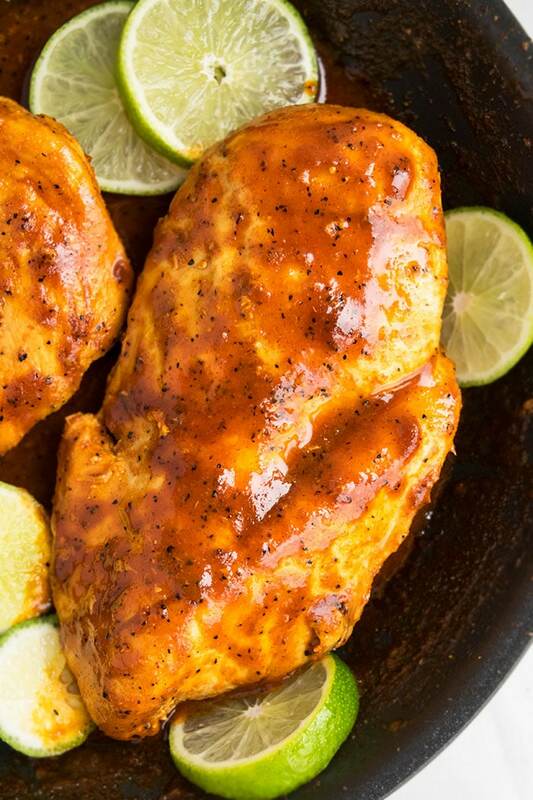 Quick and easy chili lime chicken recipe, made in one pot/ pan with simple ingredients on stovetop. This sweet & spicy 30 minute weeknight meal can also be grilled or baked. 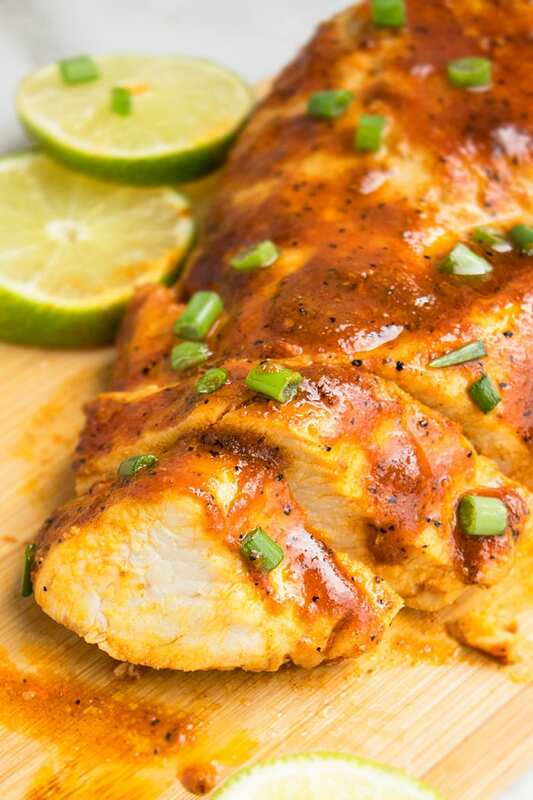 This chili lime chicken recipe has the perfect balance of sweet and spice and it is something I have been making since I was in college. I love eating it with plain jasmine rice. Hubby likes it as is and doesn’t want any sides…hehe. What sides to serve with this sweet chili chicken? Combine all the ingredients together in a a large bowl or Ziploc bag and add the chicken pieces and let it marinate for at least 1 hour or overnight. You can also just add all the ingredients in a pan, along with the chicken and cook it on the stovetop, which is what I did. 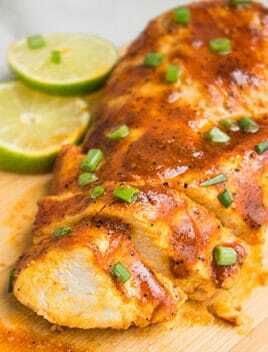 I used large boneless chicken breasts in this recipe but you can also make chili lime chicken thighs, wings or drumsticks. Adjust the amount of sweet chili sauce, red chili flakes and paprika, based on your spice preference. Based on the size of your chicken breasts, you can use up to to 5 or 6 chicken breasts in this recipe. You must use low sodium soy sauce to prevent this meal from becoming too salty. Sweet chili sauce can easily be found in grocery stores but you can also make it at home, if you like. I just buy it since it’s quicker. Don’t replace lime juice with lemon juice because it alters the flavor since lime has a very distinct zesty flavor. To enhance the lime flavor, you can also add 1 tsp lime zest. To make chili lime chicken burgers, use small chicken breast pieces (about 1 inch) and cook as per the recipe instructions below. Then, use them as a filling in burgers, along with lettuce and condiments of your choice. To make chili lime chicken tacos, slice this cooked chicken into thin strips and add them in soft or hard tacos, along with lettuce, tomatoes and shredded cheese. 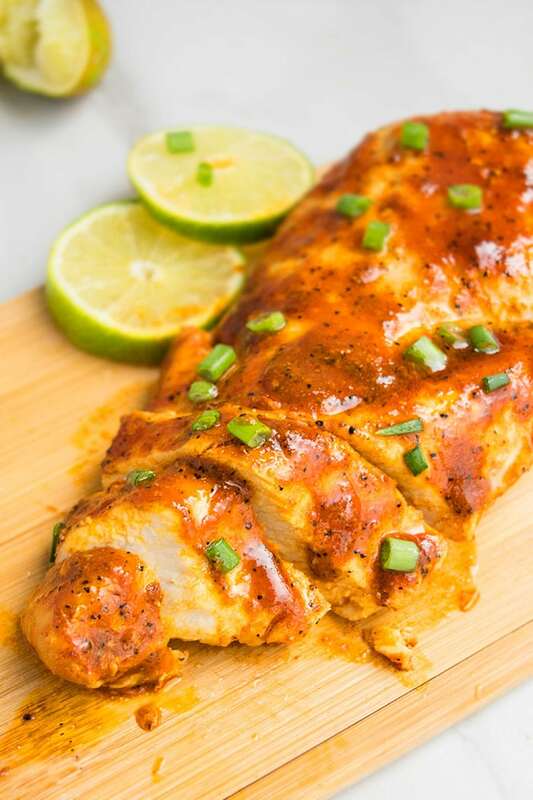 Make baked chili lime chicken by marinating chicken in all the ingredients for at least 1 hour and then baking at 375 degrees until fully cooked. 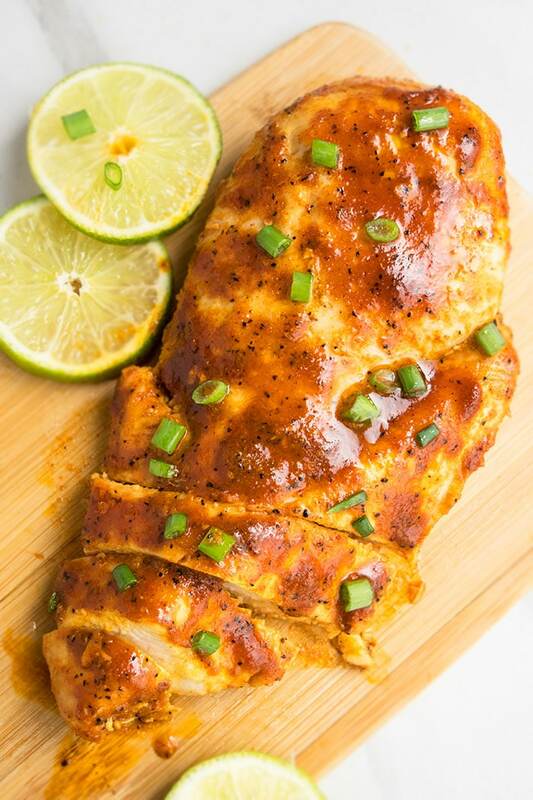 Make grilled chili lime chicken marinating chicken in all the ingredients for at least 1 hour and then baking at 375 degrees until fully cooked. To make chili lime chicken salad, slice this cooked chicken into thin strips and serve that over a bowl of lettuce, spinach, kale, onions and other vegetables of your choice. To make slow cooker/ crockpot chili lime chicken, dump all the ingredients in a slow cooker and cook on high for 3-4 hours. How to make chili lime chicken? Heat oil and saute ginger, garlic, red chili flakes, chicken until light golden brown. Add sweet chili sauce, salt, pepper, soy sauce, lime juice, honey, paprika. Then, uncover and cook until liquid is reduced and sauce thickens and chicken is fully cooked. In a large nonstick pan, heat oil over medium high heat. Add garlic, ginger, chili flakes, chicken breasts and saute for a few minutes until slightly golden brown. Be careful not to burn the ginger and garlic. Add sweet chili sauce, soy sauce, lime juice, honey, paprika, salt, pepper and mix everything together. Cover and cook for about about 10 minutes. Then, uncover and cook for a few more minutes until liquid is reduced and thick and chicken is fully cooked. Garnish with lime slices and green onions. Enjoy! Leftovers can be stored in a sealed container in the fridge for up to 2 days and can be reheated in the microwave or stovetop. This looks really tasty! Love that it’s so quick and easy to make! Sounds so flavorful and super easy to make! I am LOVING these flavors! I will have to add this to my list of must make recipes! This was freakin fabulous! The flavors are wonderful! Sp happy to hear that! I love lime and I always looking for more ways to use it in recipes.